All our yoga asanas are in preparation for the physical stillness, the anchored balance and grounded mindful awareness that Padmasana, full lotus sitting posture, affords. 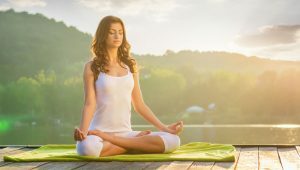 As many westerners struggle to maintain this seat for any length of time, there are many easier meditation postures, such as the ankle lock, perfect posture, the half lotus, propping a meditation cushion under the seat, kneeling posture and even sitting on a chair or stool, feet flat on the floor. Force used in any asana is counter productive: use the full lotus only when your body is adequately prepared, because you risk permanent knee damage. Your ability to enter into inner stillness depends on obviating all distractions, so finding the right posture for yourself is an important step.